People working in government services or those working with government departments get pensions after retirement from their services additionally people who have contributed towards Employee Provident Fund (EPF) also get pension under Employee Pension Scheme (EPS), 1995. Even after the death of the employee their family members are also entitled to get the pension from the employer as well as under EPS. Some employers contribute towards superannuation fund of employees so that they get pension after their retirement. From 2004 the government has shifted all its new joiners to New Pension System(NPS) where the amount of pension received by them is dependent on the amount contributed by them along with the employer to the NPS. Even self employed can also contribute towards NPS account and get annuity after their retirement. There are different tax rules for such pension and annuity. Let us discuss. For the employees who receive pension from their ex-employer is fully taxable under the head salaries. So it is not only the active employees whose salaries are taxed under the head Salaries but also the pension receive by ex-employees is also taxed under the same head. Like Salaried employees, the pensioners are also entitled to the benefit of standard deduction available upto forty thousand rupees every year which has been introduced from this year, against the pension received by them. You are entitled to commute certain portion of your pension and receive the present value of such commuted value of pension at the time of your retirement. For government employees and those working with government companies the entire value of commute pension is exempt. However for other employees commuted value of 1/3 of pension is exempt in case the employee receives any gratuity. In case the employee does not receive any gratuity, he can commute pension upto 50% of the pension and claim the same as exempt. Likewise the pension received by you under the EPS based on your contribution towards EPF is fully taxable in your hand. Since this pension is received as a result of your employment, you are entitled to claim standard deduction as discussed above. Pension received by the dependent of an employee is called family pension and is fully taxable in the hands of the dependent recipient/s. However as the pension is not received due to services rendered by the dependent the same is taxable under the head “Income From Other Source”. However the dependent person who receives the pension is entitled to claim a deduction of 1/3 of the pension received subject to a maximum of fifteen thousand rupees against the deduction of forty thousand rupees available to retired employees. In order to ensure that you receive a certain sum at a fixed period, you can buy an annuity plan from an insurance company which in turn will pay the agreed amount at the agreed interval which is annuity but loosely called pension. The amount of pension received under an annuity plan is fully taxable under the head “income from other Sources.” Since this amount does not have any co-relation with any employment, you are not entitled to claim standard deduction against this amount. 5.Annuity received from annuity policy purchased on maturity of the NPS account. The employees who have opted for NPS instead of EPF account have to mandatorily buy an annuity plan from an Indian insurance company for 40% of the accumulated corpus. The pension received by these employee should be taxable under the head Salaries but since the employee can continue to contribute to his NPS account even after he leaves his employment or even when he turns self employed, it is doubtful whether in such situation the annuity received will become taxable under the head Salaries or it should be taxable under the head “Income From other Sources”. Likewise even a self employed person can also contribute towards the NPS account and receive pension. Presently the income tax law does not have any clear cut provision as to the head under which the annuity received for annuity policy bough on retirement should be taxed. In my opinion for the salaried the pension should be taxable under the head Salaries and should also be entitled for standard deduction upto Forty thousand rupees. But Since the law is silent on this aspect it is risky to offer it under the head Salaries for claiming the standard deduction. 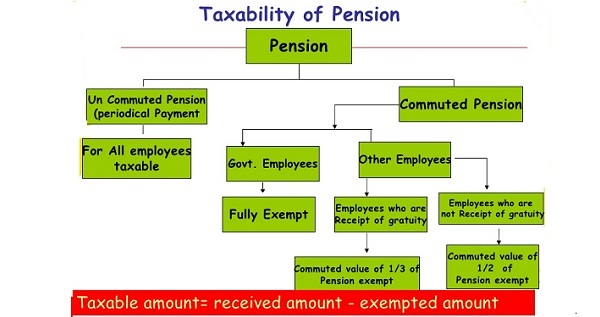 Additionally salaried and self employed both can contribute additional fifty thousands to claim deduction under Section 80 CCD(1B) so the head under which the pension received will become taxable and whether one will be entitled to claim standard deduction is a grey area and clarificatory amendment of the law is needed to clear the clouds. The writer is tax and investment expert. Please clarify what amount taxable for Govt. Pensioners i.e. after computed balance recd pension or full pension amount. i.e. I have received pension amount after computed Rs.29270/- Pension fixed Rs.34500/- Please do the needful.